Of course… once it’s stolen Mab considers the deal finished. Which would be difficult under any circumstances – let alone trying to raid the vault of a Greek God. There were so many awesome things in this book. Butters brings a lot of excellence here – someone stepping up incredibly heroicly to try and fill the void Harry has left takes incredible courage especially since Butters isn’t special or powerful. But there’s more parallels with Harry and his growth. Butters is taking some terrible risks, not just for himself, but by using some resources he is risking giving his enemies a vastly powerful tool. He is risking them all, he could doom them all; but what choice does he have? This is an excellent counterpoint to Harry’s own powerful regrets, especially around the destruction of the Red Court. As much as Michael’s deep wisdom, Butter’s own example throws a context on Harry’s acts and doing the best you can in hard situations. Bringing it all together we manage to approach Harry’s growth and morality from several different angles that comes together in an awesome whole. And that’s before we even get to the story – which I loved. I loved the world building, the introduction of Hades, the skills and reasons why Marcone has been accounted the power and rank he has. I love the way the magic works and all the intricacies they have to get through just to follow the proper magical rules to make it work. I also love the ultra-cunning plotting of the main powers of the supernatural world. Throw in lots of action, lots of adventure and Epic. 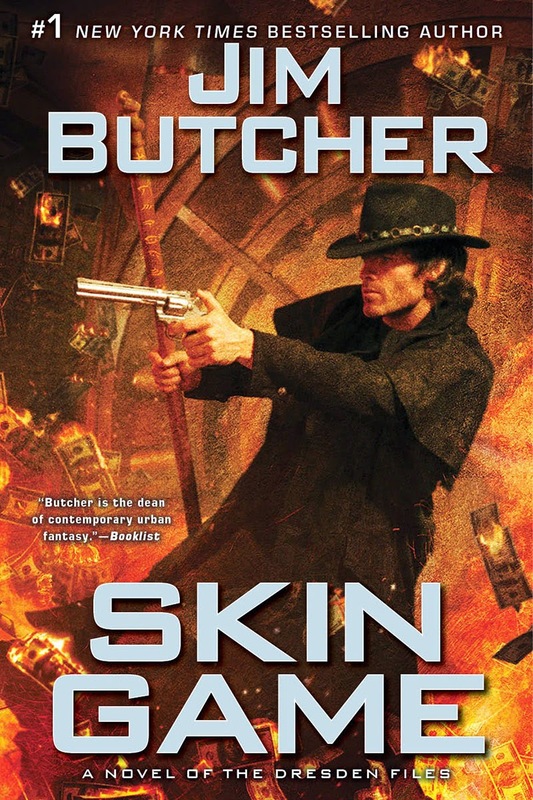 No-one writes Epic like Jim Butcher. No other author has managed to write books that have that excellent, blood-fizzing excitement that puts me on the edge of my seat. There are points in this book where I would have actually ripped off someone’s arm if they tried to distract me. There are points in this book where I would faint from exhaustion rather than stop reading. Other books manage that once, maybe twice. But to have multiple moments where industrial machinery would be needed to drag me away? That is rare, that is damn rare. There was also parkour. Which is just an extra level of coolness. But I cannot. Because there are problems. This is now book 15 in the series in which the only attempted nod to LGBT people are two women performing for the sake of a straight man (who pretends to be gay to be a hairdresser, I kid you not). Another completely erased book. There is one POC in this book – Uriel, and yes it’s nice to have an angel be a POC, but it would be nice if he actually did something other than empower a White man. This series has a real problem with diversity. Hannah’s strength is often mentioned and Harry is truly impressed by her skills and power – which would be awesome, if we didn’t also end with a big moment where Harry makes it clear how much better he is; and there’s a big moment that’s all about that. It’s an epic moment, it’s a really well written moment, it’s justified by story and I loved it. On its own it wouldn’t be a problem except for both the history of the books and the fact this only happens to Hannah. Grey, Nicodemus, Genoskwa? There’s no “you’re good but let’s have an epic scene showing why Harry is better” moment. In fact, in all three cases there’s a huge implication that in a one on one fight Harry would be reduced to a thin smear on the floor without some external factors preventing him being reduced to chunky salsa. The only other members of the team who are probably weaker than Harry are Binder (who still never has a scene where Harry directly compares his strength, is deliberately taken out of most of the action to avoid that and the whole group has a moment of worry about his particularly skill), Anna and Murphy. The three women of the group. Anna is a human, an aware human. She’s a brilliant thief – but she’s a human and pings Harry’s “zomg protect!” radar hard. While she cracks the safe, most of the rest of her role is to be protected by Harry, worried about by Harry and generally be a big walking potential victim to work around. Which brings us to the returning female characters who play a role in the book – Murphy and Charity. Murphy is several kinds of awesome, as ever, strong, capable, dangerous and someone who has developed skills and talents precisely because she is a normal human in a supernatural world. Harry seeks her out for those qualities – which never really get a chance to shine because Murphy ends up benched. Charity is a strong determined mother and… injured kidnap victim. Again again again, these women are not weak or helpless or useless characters, far from it. Hannah has a detailed history, incredible talent and her back story again exposes some of the injustices of the White Council. Anna is human but she is a skilled and capable thief who is making the most of being an aware human in a supernatural world and is one of the best safe crackers there is. And Murphy is awesome has always been awesome and always will be awesome. There are perfectly good story reasons for all of this book. But that story isn’t neutral – the author has chosen to write a story where the women are less dangerous, more imperilled and more sexualised than the men. The story doesn’t explain why the normal humans caught in the mess are women, why women are sacrificed, are defeated, weakened, injured, kidnapped and sexualised; it doesn’t explain why all of these roles are held by women, while the others are held by men nor does it change the ongoing tropes with the series. They have great, excellent elements to them – but also very glaring problems. Argh Dresden Files! I love this series. I adore this series. These are some of my desert island books. I hunger for the next book coming out in a really unhealthy and quite worrying manner. It’s on book 15 and I still love every single one and want it to continue to ever. If Jim Butcher ever stops writing I may become a very scary person and pine away in a small room for weeks. I want to do nothing but drop fulsome praise on these books forever and ever until I make everyone around me quite uncomfortable with my fanpoodling. But I cannot ignore the terrible failure at diversity in this book and the series altogether. The story, the book, the world – the 5 Fangs is deserved as it has been repeatedly deserved throughout this series. But the diversity, the depiction of women, the paucity of POC, the complete lack of disabled (except the cured) or LGBT (though we have frankly homophobic issues) characters just makes me so sad that something so wonderful could fail so terribly.